Perfect for daggers and other thin, straight blades, the Small Brown Leather Frog is handcrafted from high quality leather. 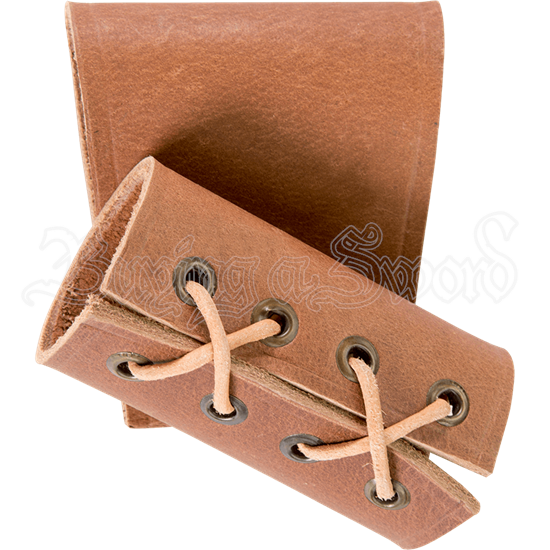 Its laces can be adjusted to suit a range of blade sizes in their scabbards, then pulled tight to secure. The brown leather is paired with lighter brown laces through metal grommets. The wide, closed belt loop slides easily onto most medieval belts. Designed to be worn on the left hip, this small medieval leather frog is ideal for thin, small swords and daggers, and its quality leather structure matches almost any character or setting.